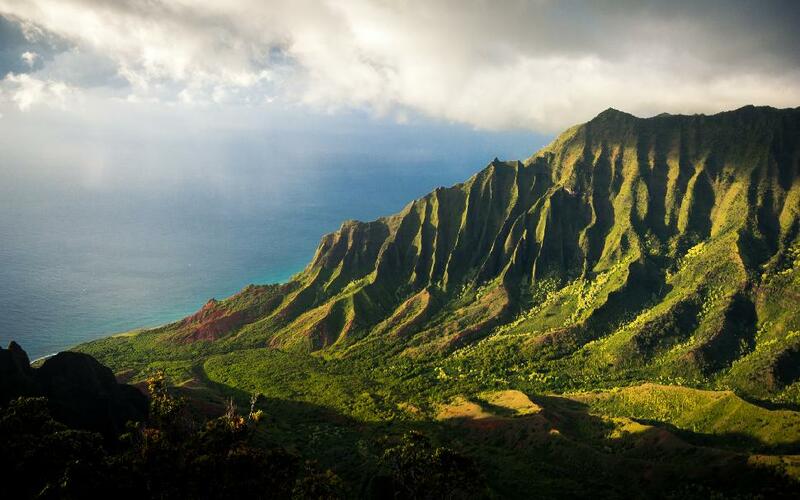 Even avid hikers and outdoors people have dreams of that idyllic Hawaiian vacation. However, instead of being pampered at a 5-star resort or baking on the beach with a Mai Tai, hikers dream of tackling some of Hawaii's most challenging trails. Images of the Kalalau Trail have been inspiring feelings of wanderlust in travellers for years, but few ever make this legendary trek. 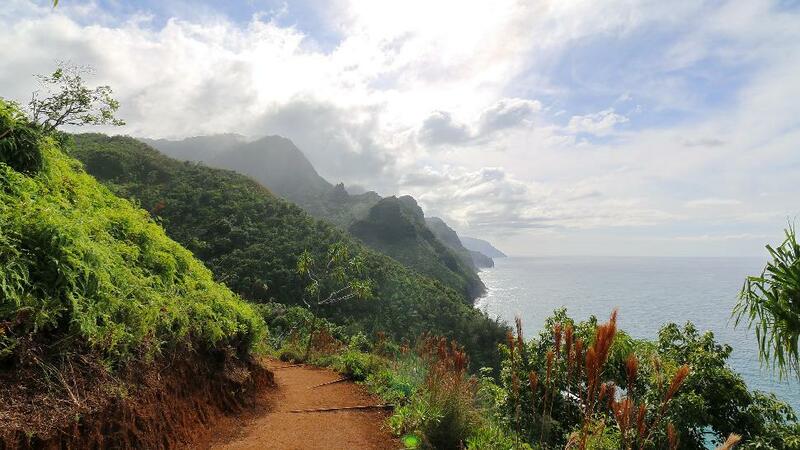 The Kalalau Trail makes a challenging 11-mile climb from Ke'e Beach to the secluded Kalalau Beach along the dramatic cliffs of the famous Na Pali Coast. Making the hike to one of the highest rated beaches in the world is reason enough to go; however, the trail is not always easy. Due to the Kalalau Trail's loose dirt, a number of hikers have actually fallen from the trail. During the stretches where hikers are skirting a cliffside with a 300-foot fall waiting for them below, the prospect of the trail crumbling beneath their feet is practically mortifying. Visitors should also note that camping is allowed on Kalalau Beach, but they must receive a permit from the Hawaii Department of Land & Natural Resources first. However, visitors can camp on the Hanakapi'ai Beach without a permit if they cannot make it back in one day. Past Hanakapi'ai Beach, day use visitors will also need a permit to hike all the way to the Kalalau Beach. The beginning the Kalalau Trail is located on the north side of Kauai, right next to the Ke'e Beach. From Lihu'e Airport, the Ke'e Beach is only an hour's drive northwest along the Kuhio Highway (Route 56). Parking is available, but as Ke'e Beach is a popular spot in its own right it will be harder to get a spot near the trailhead as the day goes on. 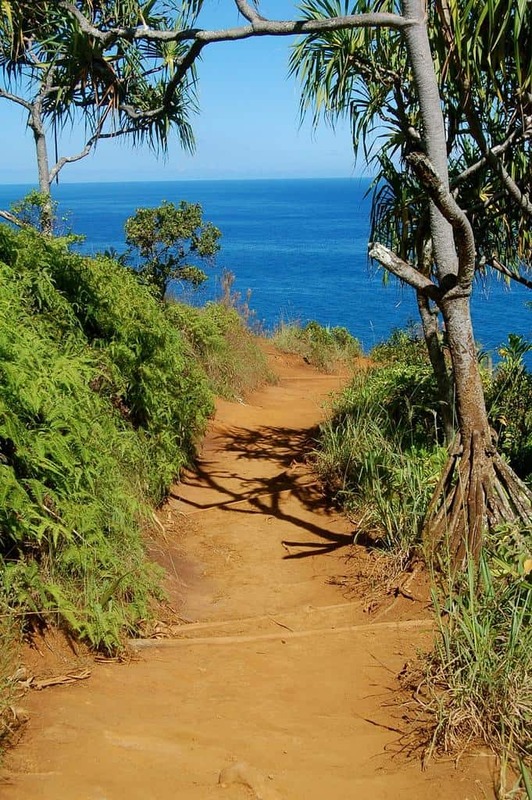 The first section of the hike from Ke'e Beach to Hanakapi'ai Beach may only be two miles, but it is still considered a moderate trek due to the heat, humidity and mud of the trail as it passed through wet jungle. Be sure to consider the warning signs that crowd the trailhead. Falling rocks, flash floods, and hazardous cliffs are all very real possibilities throughout the various sections of the trail. The trail stars off easy enough, and providing there have been no recent rain, the sun should assure the reddish brown dirt should be dry enough even though it heads into the jungle. Like it is throughout the trail, the view is amazing as the trail heads up a ridge, breaks from the jungle and begins to tower over the beautiful coastline. Be sure to stop once you get above the jungle and take a peek behind you, there is no better view of Ke'e Beach, not even from the sand. Unfortunately, hikers should not be too focused on the views throughout the hike; the exposed roots on the trail seem to be purposely placed at the best vistas to trip distracted hikers. Aside for a lot of roots, hikers will also scale the rolling ridge via ruggedly carved steps. Throughout the first two miles, the trail will randomly dip into dense jungle which unfortunately means some muddy ground. Even the best hiking boots will not make you immune to the slippery, squelching mud. About a mile into the hike, visitors will pass the stunning Pali Lookout that sits on this leg of the trail's highest point before it bottoms out at Hanakapi'ai Beach. While it may be a scenic place for a quick rest, the beach makes a better spot for a lunch or a longer stop. From here all the way to the beach, the trail will continue mostly downhill as it heads into a valley. Hikers will know they are close to Hanakapi'ai Beach when warning signs start to dot the narrow trail. They warn not to swim on Hanakapi'ai Beach due to powerful currents and riptides. The water off the beach is also very rocky so if they currents don't sweep swimmers away, they will be battered on the rocks by waves. Just past here, it is just a quick trip across a stream to the beach. There are pit toilets at the beach, but not much else; just beautiful white sand and the occasional lava boulder. During the winter months, visitors may be able to spot some kayakers off shore as well. This is usually as far as most people travel on the Kalalau Trail. The trip to Hanakapi'ai Beach is considered the safe section with all the views and none of the crumbling trails or dizzying heights. 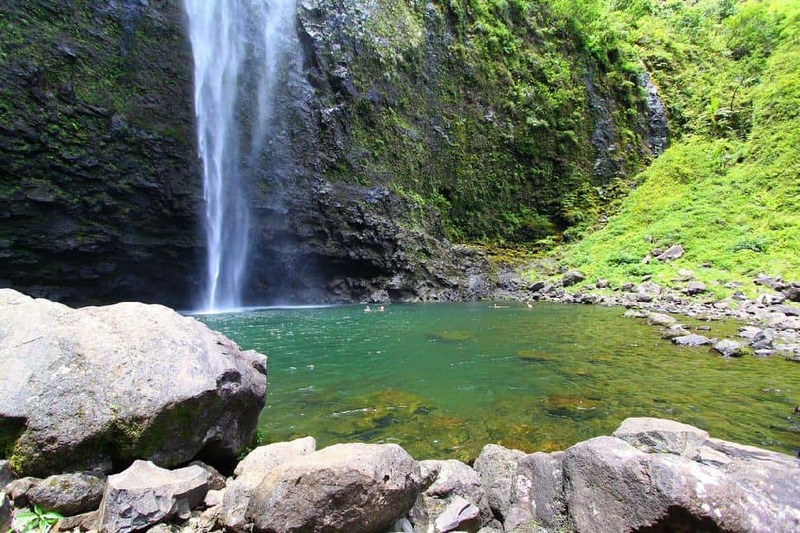 Most hikers will take the trail that heads up into the jungle towards Hanakapi'ai Falls and loop back around to Ke'e Beach. However, for those that have the determination (and the proper permits), the rest of the trail sits ahead, traveling up a ridge and into a grove of pretty sizeable Sisal plants. While the previous leg had its narrow points as it traveled through the jungle, the second leg of the Kalalau Trail to Hanakoa Valley runs a noticeably more narrow stretch of trail. As the trail heads up, sadly most of the good views lie behind the hiker, but only for this section. However, hikers should focus on climbing the steep 500-foot elevation gain that happens in less than a half mile. It is tiring and still features raised tree roots just to make things more difficult. There is a small stretch of trail that is almost flat just before the three mile marker, but unfortunately it is just a brief reprieve before a climb so steep that many hikers have had to scramble up it. This ascent marks the climb to Space Rock, the highest point along the entire trail at around 700 feet above sea level. This giant volcanic rock is not too much to look at, but after the climb it took to get there, it is a beautiful sight. It's not easy nor recommended to climb on top of Space Rock, but it does hold just as beautiful views for those who inch into the vegetation to its sides. From Space Rock, the trail loses almost half its elevation in a fourth of a mile. Unfortunately, the trail dips into wet jungle and the steep decline and the wet trail mud are the perfect recipe for slip and fall incidents. However, for those that make it down safely, the rest of the trail is a series of rolling hills as it climbs up and down into the Ho'olulu Valley, Waiahuakua Valley and finally the Hanakoa Valley. The descent into the Hanakoa Valley marks the longest descent. While heading into the valley, the trail leaves the coast for the first and last time to head into the green mountains. Hikers will need to cross a small river before the trail continues onto the other side. For those doing a multiple day hike of the area, the valley is a popular camping area. However, if rain is expected, they may want to camp close to either end of the trail to make a quick escape up high should a flash flood occur. For those camping and who still have some daylight left, there is a short trail that heads up to Hanakoa Falls that is worth the effort. Finally it is time to the last five mile leg. From Hanakoa Valley, hikers climb a series of switchbacks that are lovingly referred to as "Crawler's Ledge." As more than a few brave hikers are humbled by the narrow and exposed ledge that the trail traces, more than a few have resorted to crawling along on their hands and knees. Needless to say, for those afraid of hikes, this will be a nail-biting experience. This last and most dangerous leg is a challenge as hikers need to be very spatially aware. They need to watch their footing to assure the trail is not crumbling beneath them, and while tracing rocky ledges, they need to make sure no mountain goat are grazing above as they have been known to knock loose rocks down on hikers. So one eye up and one eye down! As Crawler's Ledge is often windy, navigating it with a full pack is a challenge at best. Most hikers will be too nerve-racked to notice, but the trail travels past a number of beautiful ravines before arriving at 8 Mile Bluff (like 8 Mile Road, but less Eminem and not in Detroit). Sitting at the 8 mile marker, this tall bluff is the least terrifying part of this leg. It leaves the edge of the cliffs and the dramatic drops behind as it travels across the beautiful rolling grassland. While parts showcase Kalalau in the distance, it is only two short miles to the beautiful beach itself. Meandering in and out of little valleys, it won't be long before hikers arrive at Red Hill, a cinder cone that sits as guardian to the entrance to Kalalau Beach. While the beautiful beach sits right in front of you, take a moment to consider that Kalalau Beach is a sacred place to the Hawaiians (thus why you need the permit). Hikers have to do their part to keep it preserved and beautiful for future generations. Like with Hanakapi'ai Beach, it's not safe to swim at Kalalau Beach, but the white sand backed by the beautifully painted cliffs in the background makes it a place that hikers won't ever forget. Have you done this hike? What recommendations or tips would you give to those looking to go?